** The WPBO 500 limited paint format will apply to all divisions from the 2017 season. This includes all EPBF World Cups as well as all 1on1 Championships. 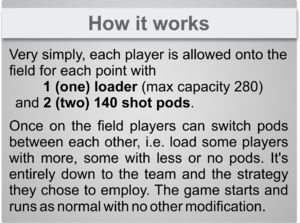 Players are limited to two paint pods and one loader when entering the field. Maximum size of Loader will have a volume capacity of 1500ml. Paint pods will have a maximum volume Capacity of 800ml. Only 0.68 calibre paintballs maybe taken onto the field. Paintballs can only be used from Authorized Loaders and Pods, any player using paintballs from any other source (example the floor) will be eliminated. Only paint purchased on site, from one of our paint sponsors can be used during an event. This includes training on the Thursday. In CPL (Pro), SP and Division 1, only markers manufactured by one of our Gun Sponsors can be used by players.